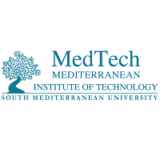 Location: THE MEDITERRANEAN INSTITUTE OF TECHNOLOGY (MEDTECH), Les Berges du Lac II, Tunisia. Position SummaryThe Department of Pre-Engineering is seeking eligible and qualified applicants for the position of Postdoc in Mathematics in charge of assisting professors with Math courses. * PhD (or about to defend) in Mathematics or Applied Mathematics from a reputed institution. * Effective interpersonal and communications skills. * Effective organizational and planning skills.